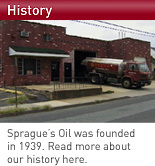 Herb Sprague founded the company in 1939. He started by filling kerosene tanks with 5 gallon cans. The industry evolved to fuel oil with central heating units in the 1940's. Harry Clune took over in 1955, and Harry Clune Jr. in 1971. ©2008 Spragues Oil Service, Inc. All rights reserved.